One day, Houston Hoyle was browsing the shops at a Renaissance fair in Florida, and something caught his eye: leather armor. He’d always liked handmade objects, and he also liked medieval gear. But when he saw the price tags, he balked. He wondered if he could make armor for less money. Houston’s interest was infectious. When he met his future wife, Tiffany, she also started tinkering with leather. 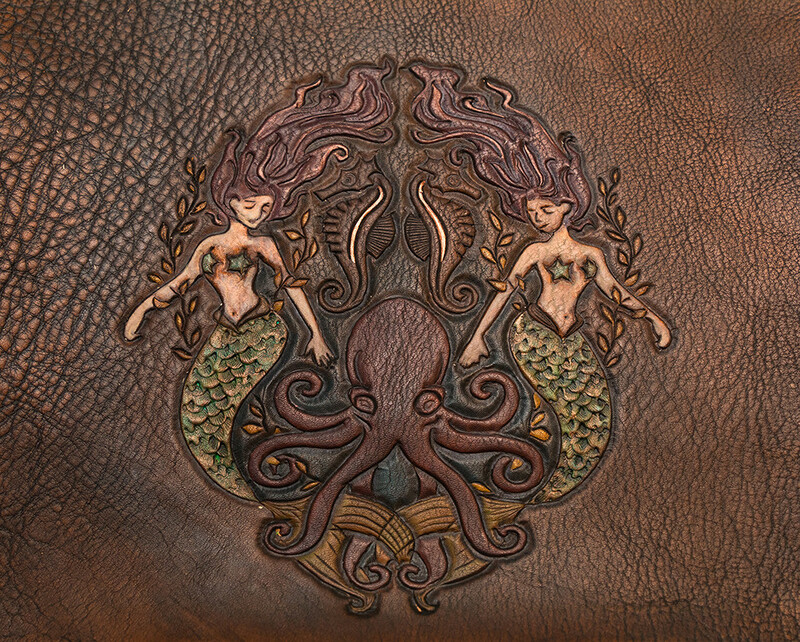 One thing led to another, and the Hoyles now own The Rogue Fae, an online storefront specializing in custom leather products. In their Westerly house, they converted an upstairs bedroom into a workspace, and they’ve posted about 200 different items to their online catalog. Both of the Hoyles are self-taught leathersmiths, and their educations are in radically different fields: Houston is a chef for the Coast Guard, and he spends much of his time in the kitchen of an 87-foot cutter. Tiffany has a Master’s degree in Environmental Science and Management; for her thesis, she mapped sea level rise using aerial LiDAR equipment. But ever since they had their two children, Tiffany started running the leather business full-time, while Houston contributes between Coast Guard shifts. Running a business can be stressful, especially while juggling other obligations. They have often considered retiring the business and treating their craft as a hobby. But the Hoyles also appreciate the time they spend together, etching personalized shapes into the tanned skins. Each piece bears special meaning for the client, and bringing that vision to life brings satisfaction.